The pace of the game in 50-over format has changed quite drastically since the last World Cup in 2015. The wickets dished out for ODIs, barring a few, are now batsmen friendly, and because of that 300 has become only a par score even against good bowling attacks. The field restrictions phase, in which the fielding captain is allowed only 4 fielders outside the 30-yard circle in the second powerplay (overs 11-40), has now become the main boundary scoring phase in ODI cricket. To add to that, two new balls are used which keeps the ball hard enough for batsmen to take full advantage throughout the entire quota of overs. The World Cup 2019, which is being held in England and Wales, looks set to follow the similar pattern of high scores and steep run chases. But which teams are best equipped to deal with the batting-friendly conditions? The Kiwis have always punched above their weight in multi-nation tournaments but the closest they have ever got to placing their hands on a World Cup was in the previous edition in 2015, when they finished second best to Australia. When you talk of the Black Caps, the one thing that comes to mind is “bits and pieces” cricketers who collectively do well as a unit. But over the last couple of years, New Zealand have managed to find proper batsmen who have the technique to adapt to any kind of match situation. If you have to do consistently well in any format of the game, the openers play a key role. 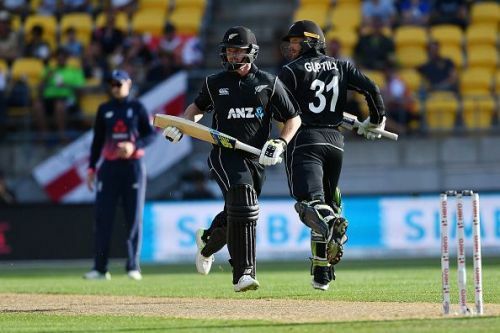 New Zealand's openers Martin Guptill and Colin Munro can be destructive and are certainly match winners on any given day. In Kane Williamson, the 2015 runners-up possess one of the best modern day batsmen going around. Williamson usually plays the anchor role to perfection. The middle order batsmen comprising of Ross Taylor and Tom Latham have the flexibility of playing the attacking or the defensive role according to the match situation. And the death overs hitting is taken care by the likes of Colin de Grandhomme and James Neesham.